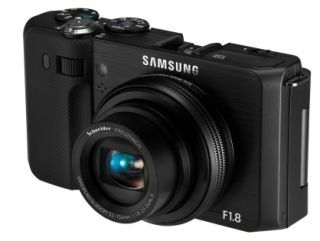 Samsung has announced two new digital cameras with the WB2000 allowing dual capture of both pictures and video and the high-end EX1 boasting a bright ultra-wide F1.8 lens which becomes the company's flagship compact. The camera comes complete with a Schneider KREUZNACH, F1.8. 24mm ultra-wide angle lens - an impressive inclusion on a compact camera. "With the EX1, Samsung further differentiates its lineup from the competition and achieves yet another milestone in the industry," said Mr. SangJin Park, CEO of Samsung Digital Imaging Company. "With ultra-wide angle capability and unparalleled speed, the EX1's lens offers a new level of versatility allowing the user to be more creative and take better pictures." Add in RAW support and a 3 inch OLED screen and you can see that this is going to be a desirable piece of kit. The WB2000 is a 10MP compact camera offering 1080p full-HD video recording, up to 1,000 fps of capture and a burst mode capable of capturing 10 full size still a second. "The WB2000 takes high-speed imaging to a new level for today's consumer," asserts Samsung's release. But it is the dual capture that will take the headlines offering the ability to shoot video and take stills at the same time – surely some kind of witchcraft. "The WB2000 is representative of Samsung's strategy to lead the digital imaging industry through product innovation," said Park. "Consumers have expressed frustration with having to choose between shooting video or taking digital stills with their camera. With the WB2000, Samsung has addressed this unmet consumer need, and now gives consumers the ability to do both simultaneously." The Samsung EX1 has a UK release date of April 2010 and the WB2000 is pegged to Spring 2010, with no prices yet announced.